The modern study of Japanese aesthetics only started a little over two hundred years ago in the West. The Japanese aesthetic is a set of ancient ideals that include wabi (transient and stark beauty), sabi (the beauty of natural patina and aging), and yūgen (profound grace and subtlety). These ideals, and others, underpin much of Japanese cultural and aesthetic norms on what is considered tasteful or beautiful. Thus, while seen as a philosophy in Western societies, the concept of aesthetics in Japan is seen as an integral part of daily life. Japanese aesthetics now encompass a variety of ideals; some of these are traditional while others are modern and sometimes influenced by other cultures. Shinto is considered to be at the fountain-head of Japanese culture. With its emphasis on the wholeness of nature and character in ethics, and its celebration of the landscape, it sets the tone for Japanese aesthetics. Nevertheless, Japanese aesthetic ideals are most heavily influenced by Japanese Buddhism. In the Buddhist tradition, all things are considered as either evolving from or dissolving into nothingness. This "nothingness" is not empty space. It is rather a space of potentiality. If the seas represent potential then each thing is like a wave arising from it and returning to it. There are no permanent waves. At no point is a wave complete, even at its peak. Nature is seen as a dynamic whole that is to be admired and appreciated. This appreciation of nature has been fundamental to many Japanese aesthetic ideals, "arts," and other cultural elements. In this respect, the notion of "art" (or its conceptual equivalent) is also quite different from Western traditions (see Japanese art). Wabi and sabi refers to a mindful approach to everyday life. Over time their meanings overlapped and converged until they are unified into Wabi-sabi, the aesthetic defined as the beauty of things "imperfect, impermanent, and incomplete". Things in bud, or things in decay, as it were, are more evocative of wabi-sabi than things in full bloom because they suggest the transience of things. As things come and go, they show signs of their coming or going, and these signs are considered to be beautiful. In this, beauty is an altered state of consciousness and can be seen in the mundane and simple. The signatures of nature can be so subtle that it takes a quiet mind and a cultivated eye to discern them. In Zen philosophy there are seven aesthetic principles for achieving Wabi-Sabi. Miyabi (雅) is one of the oldest of the traditional Japanese aesthetic ideals, though perhaps not as prevalent as Iki or Wabi-sabi. In modern Japanese, the word is usually translated as "elegance," "refinement," or "courtliness" and sometimes referred to as "heart-breaker". The aristocratic ideal of Miyabi demanded the elimination of anything that was absurd or vulgar and the "polishing of manners, diction, and feelings to eliminate all roughness and crudity so as to achieve the highest grace." It expressed that sensitivity to beauty which was the hallmark of the Heian era. Miyabi is often closely connected to the notion of Mono no aware, a bittersweet awareness of the transience of things, and thus it was thought that things in decline showed a great sense of miyabi. Shibui (渋い) (adjective), shibumi (渋み) (noun), or shibusa (渋さ) (noun) are Japanese words which refer to a particular aesthetic or beauty of simple, subtle, and unobtrusive beauty. Originating in the Muromachi period (1336–1392) as shibushi, the term originally referred to a sour or astringent taste, such as that of an unripe persimmon. Shibui maintains that literal meaning still, and remains the antonym of amai (甘い), meaning 'sweet'. Like other Japanese aesthetic terms, such as iki and wabi-sabi, shibui can apply to a wide variety of subjects, not just art or fashion. Shibusa includes the following essential qualities. (1) Shibui objects appear to be simple overall but they include subtle details, such as textures, that balance simplicity with complexity. (2) This balance of simplicity and complexity ensures that one does not tire of a shibui object but constantly finds new meanings and enriched beauty that cause its aesthetic value to grow over the years. (3) Shibusa is not to be confused with wabi or sabi. Though many wabi or sabi objects are shibui, not all shibui objects are wabi or sabi. Wabi or sabi objects can be more severe and sometimes exaggerate intentional imperfections to such an extent that they can appear to be artificial. Shibui objects are not necessarily imperfect or asymmetrical, though they can include these qualities. (4) Shibusa walks a fine line between contrasting aesthetic concepts such as elegant and rough or spontaneous and restrained. Iki (いき, often written 粋) is a traditional aesthetic ideal in Japan. The basis of iki is thought to have formed among urbane mercantile class (Chōnin) in Edo in the Tokugawa period (1603–1868). Iki is an expression of simplicity, sophistication, spontaneity, and originality. It is ephemeral, straightforward, measured, and unselfconscious. Iki is not overly refined, pretentious, complicated. Iki may signify a personal trait, or artificial phenomena exhibiting human will or consciousness. Iki is not used to describe natural phenomena, but may be expressed in human appreciation of natural beauty, or in the nature of human beings. The phrase iki is generally used in Japanese culture to describe qualities that are aesthetically appealing and when applied to a person, what they do, or have, constitutes a high compliment. Iki is not found in nature. While similar to wabi-sabi in that it disregards perfection, iki is a broad term that encompasses various characteristics related to refinement with flair. The tasteful manifestation of sensuality can be iki. Etymologically, iki has a root that means pure and unadulterated. However, it also carries a connotation of having an appetite for life. Jo-ha-kyū (序破急) is a concept of modulation and movement applied in a wide variety of traditional Japanese arts. Roughly translated to "beginning, break, rapid", it implies a tempo that begins slowly, accelerates, and then ends swiftly. This concept is applied to elements of the Japanese tea ceremony, to kendō, to the traditional theatre, to Gagaku, and to the traditional collaborative linked verse forms renga and renku (haikai no renga). Yūgen (幽玄) is an important concept in traditional Japanese aesthetics. The exact translation of the word depends on the context. In the Chinese philosophical texts the term was taken from, yūgen meant "dim", "deep" or "mysterious". In the criticism of Japanese waka poetry, it was used to describe the subtle profundity of things that are only vaguely suggested by the poems, and was also the name of a style of poetry (one of the ten orthodox styles delineated by Fujiwara no Teika in his treatises). "To watch the sun sink behind a flower clad hill. To wander on in a huge forest without thought of return. To stand upon the shore and gaze after a boat that disappears behind distant islands. To contemplate the flight of wild geese seen and lost among the clouds. Zeami was the originator of the dramatic art form Noh theatre and wrote the classic book on dramatic theory (Kadensho). He uses images of nature as a constant metaphor. For example, "snow in a silver bowl" represents "the Flower of Tranquility". Yūgen is said to mean "a profound, mysterious sense of the beauty of the universe ... and the sad beauty of human suffering". It is used to refer to Zeami's interpretation of "refined elegance" in the performance of Noh. Geidō (芸道) refers to the various traditional Japanese arts disciplines: Noh (能) (theater), kadō (華道) (Japanese flower arrangement), shodō (書道) (Japanese calligraphy), Sadō (茶道) (Japanese tea ceremony), and yakimono (焼物) (Japanese pottery). All of these disciplines carry an ethical and aesthetic connotation and teach an appreciation of the process of creation. To introduce discipline into their training, Japanese warriors followed the example of the arts that systematized practice through prescribed forms called kata - think of the tea ceremony. Training in combat techniques incorporated the way of the arts (Geidō), practice in the arts themselves, and instilling aesthetic concepts (for example, yugen) and the philosophy of arts (geido ron). This led to combat techniques becoming known as the martial arts (even today, David Lowry shows, in the 'Sword and Brush: the spirit of the martial arts', the affinity of the martial arts with the other arts). All of these arts are a form of tacit communication and we can, and do, respond to them by appreciation of this tacit dimension. Because of its nature, Japanese aesthetics has a wider relevance than is usually accorded to aesthetics in the West. In her pathmaking book, Eiko Ikegami reveals a complex history of social life in which aesthetic ideals become central to Japan's cultural identities. She shows how networks in the performing arts, the tea ceremony, and poetry shaped tacit cultural practices and how politeness and politics are inseparable. She contends that what in Western cultures are normally scattered, like art and politics, have been, and are, distinctly integrated in Japan. After the introduction of Western notions in Japan, Wabi Sabi aesthetics ideals have been re-examined with Western values, by both Japanese and non-Japanese. Therefore, recent interpretations of the aesthetics ideals inevitably reflect Judeo-Christian perspectives and Western philosophy. Many traditional Japanese aesthetic criteria are manifest in, and discussed as part of, diverse elements of Japanese cuisine; see kaiseki for a refined expression. A modern phenomenon, since the 1970s cuteness or kawaii (可愛い, "cute", "adorable", "loveable") in Japanese has become a prominent aesthetic of Japanese popular culture, entertainment, clothing, food, toys, personal appearance, behavior, and mannerisms. As a cultural phenomenon, cuteness is increasingly accepted in Japan as a part of Japanese culture and national identity. Tomoyuki Sugiyama, author of "Cool Japan", believes that "cuteness" is rooted in Japan's harmony-loving culture, and Nobuyoshi Kurita, a sociology professor at Musashi University in Tokyo, has stated that "cute" is a "magic term" that encompasses everything that's acceptable and desirable in Japan. ^ a b "Japanese Aesthetics (Stanford Encyclopedia of philosophy)". Retrieved 2009-06-10. ^ "Teaching Japanese Aesthetics". Archived from the original on 2008-12-02. Retrieved 2008-12-03. ^ Herbert, Jean (1967). 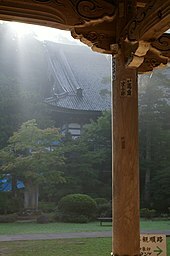 Shinto; at the fountain-head of Japan. Stein and Day. ASIN B0006BOJ8C. ^ "Japanese Aesthetics, Wabi-Sabi, and the Tea Ceremony" (PDF). Retrieved 2008-12-03. ^ a b Koren, Leonard (1994). Wabi Sabi for artists, designers, poets and philosophers. Berkeley, CA: Stone Bridge Press. ISBN 1-880656-12-4. ^ "What Is Wabi-Sabi?". Retrieved 2007-04-01. ^ "The nature of garden art". Retrieved 2008-12-06. ^ a b Carter, Robert E. (2008). Japanese arts and self-cultivation. New York, NY: SUNY Press. ISBN 978-0-7914-7254-5. ^ "Taste of Japan". Archived from the original on 2007-04-30. Retrieved 2007-04-01. ^ Zeami. "Teachings on Style and the Flower (Fūshikaden)." from Rimer & Yamazaki. On the Art of the Nō Drama. p20. ^ "Zeami and the Transition of the Concept of Yūgen" (PDF). Retrieved 2008-12-08. ^ Yamazaki, Masakazu; J. Thomas Rimer (1984). On the Art of the No Drama : The Major Treatises of Zeami. Princeton, NJ: Princeton University Press. ISBN 0-691-10154-X. ^ Ikegami, Eiko (2005). Bonds of Civility: aesthetic networks and the political origins of Japanese culture. New York, NY: Cambridge University Press. ISBN 0-521-60115-0. ^ "Japan - the society". Retrieved 2008-12-07. ^ Diana Lee, "Inside Look at Japanese Cute Culture" (September 1, 2005). ^ Quotes and paraphrases from: Yuri Kageyama (June 14, 2006). "Cuteness a hot-selling commodity in Japan". Associated Press. Murase, Miyeko (2000). Bridge of dreams: the Mary Griggs Burke collection of Japanese art. New York: The Metropolitan Museum of Art. ISBN 0-87099-941-9.